We left behind the high winds of the pampas of Argentina (yes, the sign below was flattened in a wind storm) as we worked our way into the Andean foothills, stopping first in Travelin (a very Welsh town, complete with tea houses and high teas) and then exploring Parque Nacional de los Alerces, which was founded for its ancient alerces and araucaria trees. An unexpected bonus—our favorite kind of overlanding—was stumbling on the Annual Fiesta de Asada (bbq meat) in Cholila, Argentina. Bariloche, a beautiful town on a large lake in the foothills, was a fun stop where we discovered Los Vikingos Pub, much to Jonathan's delight (they featured Che posters as well). Saw some interesting Troller jeeps (made in Brazil) on their way from that country to Ushuaia, and we met Jay and Alana, two Aussies who are just starting out on six months overlanding in the 2007 4Runner they bought in Santiago for $12,000 (and expect to sell it when finished for about the same). Once in Chile, we needed to get up to Santiago for some business, but stopped for lunch at a hidden gem in the industrial town of Temuco. Tradiciones Zuny serves Mapuche and Chilean dishes that are out of this world; we had cazuela, fresh juices, an asado plate with rice, corn, and quinoa, and dessert for under $18. 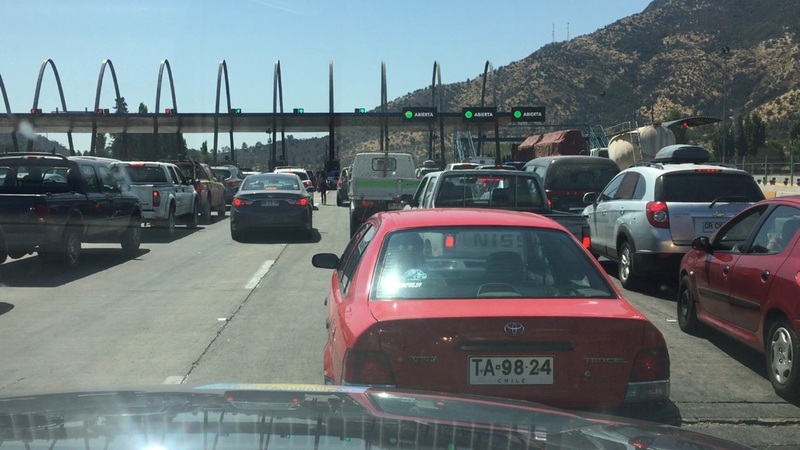 Chile so far, however, has been draining our wallet: at least 6 tolls so far on the Highway 5 (new Panamerican) have set us back more than $50USD.